Featuring 14 different presets, the Gourmia Express Pot Pressure Cooker comes complete with an adjustable timer and pressure control so everything you make, from chili to Yogurt, rice and more cooked faster, with less effort. Like many other Instant Pots, the Gourmia Express Pot promises to allow you to slow cook, saute, and steam your meals to completion in a fraction of the time it would take you on the stove or over, with less to clean up at the end. One thing that I admire about the Express Pot is it that right of the bat, it looks incredible. 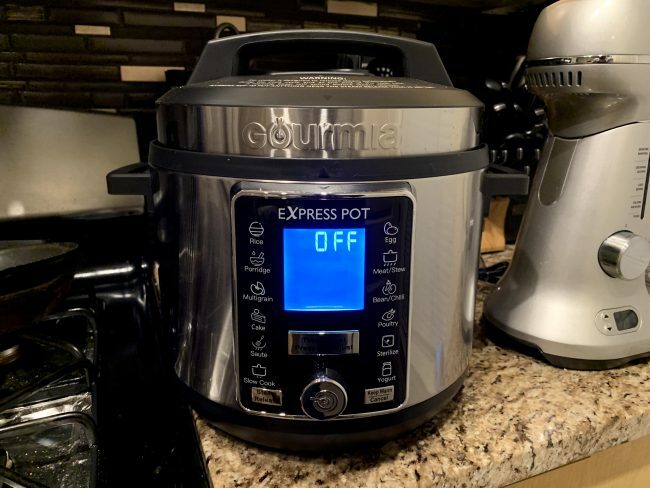 While I have an InstantPot, the Express Pot by Gourmia not only looks better with its stainless steel appearance, but it’s impressive enough to sit on your countertops when not in use as well. One thing that I absolutely DREAD cooking on the stovetop is rice. It’s tedious, and I hate standing over the stove making sure that not only it doesn’t burn, but waiting for water to boil is a waste of time in my personal opinion. This isn’t the case anymore with the Gourmia Express Pot. With the 6 quart capacity of the Goumia ExpressPot, now I can simply use the 1 to 1 method (rice to water), in order to get a perfectly cooked pot of rice that all I have to do is fluff up with a fork. Since most of my meal prep these days consist of Chicken and rice, I can virtually do everything within one pot. Being able to saute vegetables, cook dried beans, and MOST importantly, even cooking my meats (frozen or fresh), means I don’t have to set food on the counter to defrost them is a blessing in disguise. One thing that’s worth mentioning however is the fill line within the inner pot. You have to be mindful, especially when cooking items like chili, to not go above the fill line, as your food, liquids included can burn if you don’t obey the fill line. Gourmia was nice enough to include a little cookbook if you wanted to try various different meals but for me, I stick to the same 5 or 6 meals. Aside from the cookbook,t hey include a measuring cup and a mixing spoon which although nice, I found the mixing spoon to be on the small side, and not serving me any good when it comes to stirring my meals. 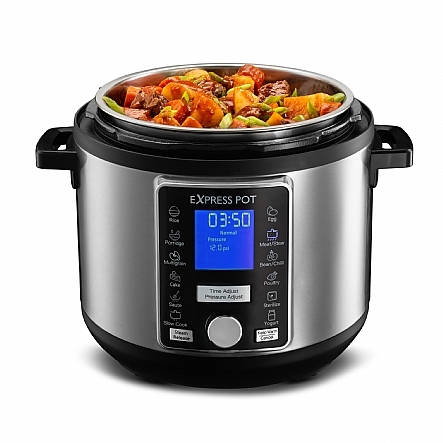 Aside from that, the Gourmia Express Pot has all but replaced my Instantpot, so much so, I purchased a second one, so when we have family functions, I can create my famous chili in one pot, and my meatballs in another, and when family comes over, I can use the automatic “stay hot” mode, so meals will be able to do just that until it’s dinner time. 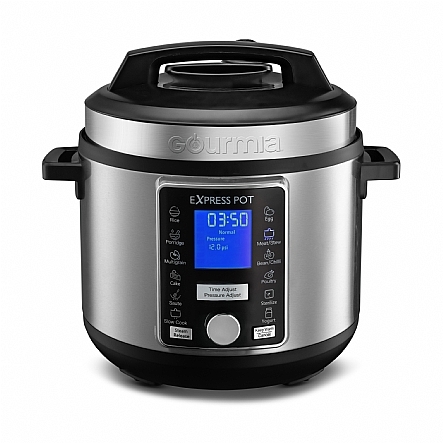 I’m personally a fan of the Gourmia Express Pot, but if you’d like to check it out for yourself, you can directly at Gourmia.com. What Needs Improvement: Possibly an 8-quart model?